Take a day trip from Tokyo to Ibaraki, a prefecture renowned for its outdoor beauty. Using the JR TOKYO Wide Pass, immerse yourself in relaxing nature enjoying traditional gardens, local soba noodles, and flower-filled hillsides by the sea. Ibaraki, located just over an hour from Tokyo, is a prefecture boasting many picturesque, nature-filled destinations. Using the JR TOKYO Wide Pass for my transportation, I enjoyed a day of photographing beautiful scenery and indulging in Ibaraki's regional cuisine. 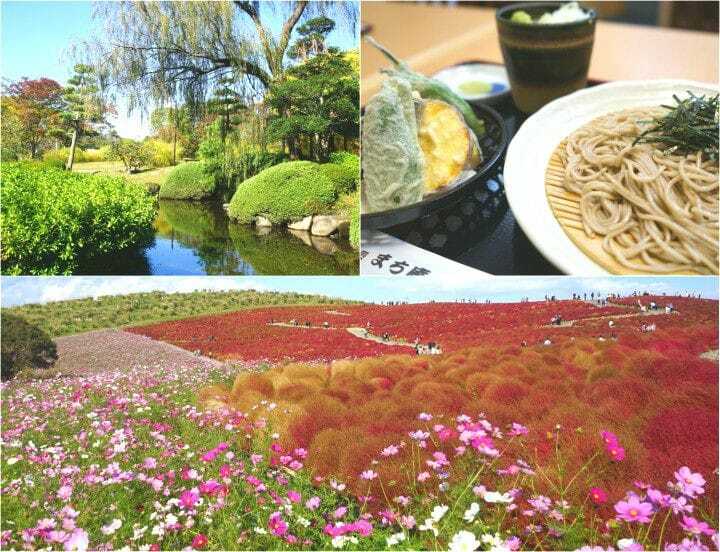 My day trip includes Kairakuen, a historical Japanese garden, Hitachi Seaside Park, known for its expansive flower fields and Pacific coast view, and Soba Izakaya Machian, a local restaurant offering specialty buckwheat noodles. Separated from the bustle of Tokyo, I spent the day enjoying nature, delicious food and taking plenty of photos to share with my family and friends. I purchased the JR TOKYO Wide Pass at the JR EAST Travel Service Center at Ueno Station pictured above. It is located directly outside the central ticket gates and English support is available. *1... JR TOKYO Wide Pass can be utilized for reserved and non-reserved cars on specified Shinkansen (bullet train), local, limited express, and express trains on JR EAST lines as well as other specified railways. Certain restrictions and limitations apply and are subject to change depending on the season. (See https://www.jreast.co.jp/e/tokyowidepass/index.html for more details.) It is recommended that you carry your passport with you at all times when using this pass. The JR TOKYO Wide Pass looks like this! After buying the pass, head to the ticket gate area attended by employees and present your pass. The first time you use it, an attendant at the window will stamp a date on the back of the pass. The limited express train headed to Ibaraki has only reserved seating, so please make sure to reserve your seat beforehand. I rode the 9:00 departure Hitachi, a limited express train, bound for Iwaki, and arrived at Mito Station at 10:14. Upon arriving at Mito Station, head out the central ticket gate. Look for the north exit sign and take the stairs on your left to reach the bus stop for Kairakuen, our first destination. The bus to Kairakuen departs from the no. 4 bus platform on the street level of the Kitaguchi (North Exit) area of Mito Station. It is located right in front of the stairs you descend from the station. There is well-marked signage with English as well. To reach Kairakuen, board the 10:30 departure bus from the back and get off at Kairakuen Iriguchi. Each stop on the bus is displayed in Japanese, English, Chinese, and Korean on a digital screen above the driver. The ride takes around 20 minutes and will cost 240 yen one way (including tax). Please note that you must pay the exact fare amount in cash. Kairakuen is a stunning traditional garden which was designated as one of three great gardens in Japan. It is renowned in particular for its plum blossoms (ume) during the early spring, when 3,000 plum trees bloom all at once. Additionally, you can appreciate cherry blossoms in April, scarlet azaleas and bright greenery in summer, and golden and red foliage in fall. The garden was originally established in 1842 by Tokugawa Nariaki, the 9th lord of the Mito domain. It is said that he wanted to create a place where townspeople could enjoy the surrounding lakes and mountains, resulting in Kairakuen's construction. Within vast garden grounds, there are several different areas offering various perspectives and scenes visitors can appreciate, which is an element representative of Japanese gardens. A bamboo forest greeted me as I walked along the path from the front gate, making me feel very at peace and relaxed. Continuing down the path will lead you to an area with a landscaped pond. The surrounding greenery just beginning to show hints of autumn, in contrast with the crystal blue waters, was stunning. I also went inside the multi-storied Kobuntei, which visitors can enter for 200 yen (100 yen for children and junior high schoolers). The route leads you through rooms with different art and varying views of the gardens outside. The traditional Japanese rooms along with the stunning landscapes outside Kobuntei is an incredibly relaxing experience. I lingered in each room, amazed at the detail of the art and the gorgeous view of the gardens. After wandering through the garden, walk back to the gate to the bus stop. Board the bus leaving at 11:55 from Kairakuen and get off at Minami-machi Sanchome to arrive at Mito Ichozaka branch of Soba Izakaya Machian, a restaurant offering regional soba (buckwheat noodles). Soba Izakaya Machian is a restaurant specializing in dishes featuring Hitachi Aki soba, a variety of aromatic and flavorful buckwheat noodles originating from Ibaraki. The soba offered here is fresh and made by hand daily. To go along with the soba, you can choose tempura and traditional Japanese dishes which all utilize high-quality, local ingredients. The interior is casual and has a friendly atmosphere, with counter seating facing the kitchen and two tables. Lining the tops of the counters are different varieties of shochu (distilled spirits), including a large selection from local breweries. I ordered Vegetable Tempura Zaru Soba set (920 yen including tax), which comes with soba topped with dried seaweed, fragrant dipping broth, and a side of tempura. Pick up some soba noodles, dip into the broth, and enjoy! The noodles have an ideal consistency and shape and have a light buckwheat flavor. The side of vegetable tempura (mine has: sweet potato, pumpkin, eggplant, and shishito pepper) is light and crispy, adding the perfect contrast to the smooth texture of the noodles. After my satisfying lunch, I took a 5-minute walk back to Mito Station to ride the train to my next destination: Hitachi Seaside Park, an expansive park attracting international attention for its picturesque, colorful flower fields by the ocean. I took the 13:26 train on the JR Joban Line heading towards Iwaki from Mito Station. Get off at Katsuta Station (one stop, 7-minute ride). Once at Katsuta Station, exit the train station and walk to the east exit, down the stairs to the street level, to reach bus platform no. 2. It is a 22-minute bus ride to Hitachi Seaside Park and costs 400 yen one way (including tax). Similar to the bus for Kairakuen, you must pay in exact change. Hitachi Seaside Park, the final destination on my trip, is an expansive park overlooking the Pacific Ocean, renowned for its picture-perfect fields of flowers, plants, and nature. The size of the park and other attractions, like a Ferris Wheel and restaurants, make it easy to spend a half-day or even a full day here. The park is particularly famous for its Kochia, an otherworldly-looking plant, which transform into a bright reddish hue around mid-October. Colorful Kochia filled the Miharashi Hill located in the Miharashi area, putting an instant smile on my face. Other visitors shared my joy and were photographing these amazing plants as well. Alongside the Kochia are endless fields of blooming white and pink cosmos. The top of the hill also was filled with silver pampas grass which provided me with a spectacular view of the park and Ferris wheel in the distance. In addition to the Kochia and cosmos, the park is brimming with various flowers and landscapes. The Hitachi Rose Garden is beautiful until around the beginning of November, featuring all different types and hues of fragrant blooms. To navigate through the park comfortably, I suggest renting a bicycle (3 hours for 400 yen) or taking the seaside train, which runs through the park (500 yen for a 1-day ticket). Fixed holidays Closed every Monday except during the following periods: 3/26-5/31, 7/21-8/31, 10/1-10/31, 12/25-12/30, 1/2-1/7 Also, in the case a national holiday falls on Monday, the park is open on Monday and closed on the following Tuesday. After a few hours at Hitachi Seaside Park, I returned to Katsuta Station, leaving from the park's west entrance. I took the 16:51 bus. After a 15-minute bus ride, you will arrive at the bus platform no. 1 at Katsuta Station. Return to the JR train station and take the 17:47 limited-express Tokiwa bound for Shinagawa back towards Tokyo. I arrived back home feeling refreshed by the spectacular scenery in Ibaraki and ready to share the stunning photos I took that day. To ride the limited express trains Hitachi and Tokiwa, you can reserve your seat online using this page. Reds, Oranges And Golds - Come Relish The Fall Colors In Ibaraki!